Bob Reeves developed his sleeve system in 1973 as a method for adjusting the annulus ("gap") between the end of the mouthpiece and the beginning of the lead pipe. This allows the player to "fine tune" the playing back pressure of his/her set-up. It also allows the player to use one mouthpiece on different instruments that require a different gap. The correct gap can only be determined through experimentation as it varies from player to player, mouthpiece to mouthpiece, and instrument to instrument. 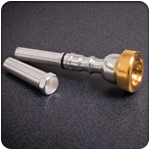 Virtually any trumpet mouthpiece can be converted to use Bob Reeves sleeves. They are available in sizes #0.5 through #7 in half sizes. A #0.5 sleeve will give you the greatest gap. A #7 is the smallest. IMPORTANT! Your mouthpiece must be "cut for sleeves" to use Bob Reeves Sleeves. Remember, too much gap is bad, but too little is worse.